For too long, owner operators have manually managed operational maintenance and equipment integrity (safe uptime = profitability) using paper-based processes or monthly reporting cycles. In the new technological climate, this approach has been proven to be less effective. “The industry is experiencing a degree of variability in the business that’s never been seen before. Traditional ERP systems can’t handle it.” Variables that affect key business decisions are no longer changing once every 30-90 days. Now, they can change in minutes. With IIoT, operators can bridge that data gap. They can deploy digital platforms that can aggregate, centralize, store and analyze all data from disparate sources into one database. 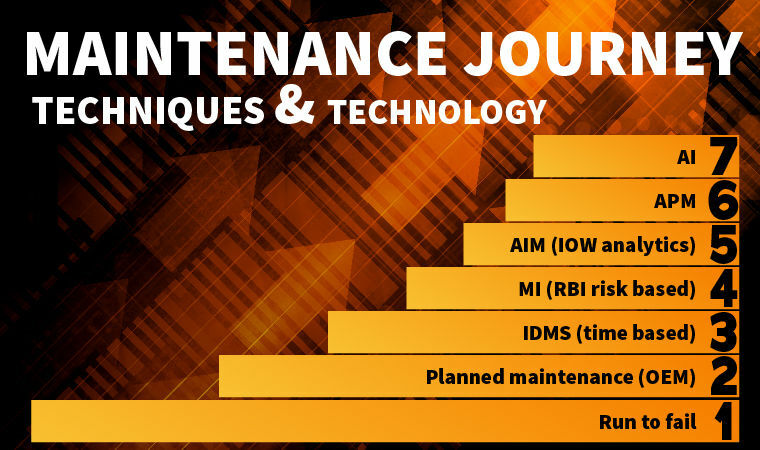 They can utilize intelligent data analytics such as Risk Based Inspection (RBI) and Integrity Operating Windows (IOW) to garner actionable intelligence from their data in real time, making it possible to stay on top of asset performance and adopt predictive maintenance before costly loss of containment or unplanned shutdowns occur. The journey to IIoT begins in the earliest stages of the life cycle, namely with how the data is collected and the analytics applied to it. By digitalizing processes at the inspection data management (IDMS) stage, you are equipped with the ability to garner actionable intelligence from your data in real time. This enables you to apply sophisticated analytics at the MI and AIM stages, which then improves the artificial intelligence (AI) potential of later stages. Data is data: you have to apply some AI to it in order to turn it into knowledge and verify that it’s repeatable and scaleable. Only then can you turn that into intelligence that would be the baseline for machine learning and cognitive learning. If dated, paper-based, cyclical reporting schedules are the basis for the formative stages of your life cycle model, you will never be able to capitalize on the benefits of IIoT. 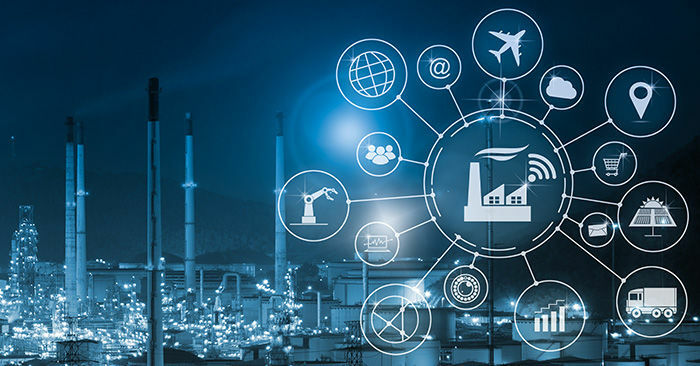 The most crucial factor in digitalization is adoption of emerging IIoT technologies at the earliest stages (IDMS/MI/AIM) in order to facilitate the intelligence required for continued evolution via AI later on. Implementing software platforms to digitalize IDMS, MI and AIM processes will facilitate greater insight into the operational health of assets. If a plant operator is alerted to possible equipment failure, he can immediately respond to reduce that from happening while re-investigating the equipment’s inclusion in the next planned shutdown or TAR. In the short term, that helps prevent costly unplanned outages. In the long term, that affords the company time to develop a permanent solution to the issue at hand. Based on the size and complexity of the process/plant, this is potentially millions of dollars in savings. The process of undergoing digitalization might seem daunting. It is a journey, not a plug and play. These days, digitalized technologies are more affordable than ever. In fact, early ROI and productivity gains being reported are much more significant than initially thought. Further steps that owner operators can take is to choose a software solution that is scalable. This allows the company to start small with a basic Inspection Data Management Solution (IDMS) and then to grow as they need to at a pace they can handle. Look for solution providers that offer multi-leveled, extensible and scalable product options. Next, to stay ahead of the curve, look for a system that is available both on the premises and software as a service hosted on “the cloud.” This allows critical data to be exchanged anywhere, in real-time, between the office and the field. To maximize time and access, seek a product that offers “on the go” field work order management from a mobile device. With companies all over the globe modernizing their industrial processes, the time to invest is now. Don’t waste capital resources on short-term fixes to problems. It is much more prudent to invest in digitalization technologies for long-term profitability, allowing you to be competitive. Metegrity delivers quality and asset integrity management software for plants, pipelines and facilities. Our products help you leverage IIoT for vastly improved profitability and enhanced ROI. Our strategic implementation team and partners can help assess your current state, needs and implement tailored strategies for modernization. We currently protect over $550 billion in assets across 850 facilities worldwide. Keith Davidson is the Metegrity, Inc. Business Manager for US Operations based in Houston, TX. Keith has over 20 years experience with Strategic Technology Solutions, Consulting and Delivery to the Petrochemical, Oil & Gas Industries. Keith is experienced in building value by translating complex technology into deliverable, Comprehensive Solutions for Process Optimization - Asset Integrity (AIM) in Production, Plants, Pipelines and Facilities.